Make this fennel-crusted salmon for a fast but fancy weeknight meal. 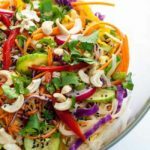 Whole30, Paleo and Keto-friendly. Fennel and salmon are a match made in heaven. Ready in less than 30 minutes! 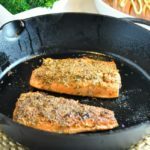 I first published this baked salmon recipe in 2015. It’s a favourite of ours, so I’ve updated this post and bumped it up to the top! This Fennel-Crusted Salmon is equally as delicious and just as easy as my Pistachio-Crusted Salmon. I’ve adapted this recipe from one published in Salmon: The Cookbook –edited by Bill Jones. When I first read this recipe, I was doubtful that the two flavours would mesh, but it’s a perfect match. 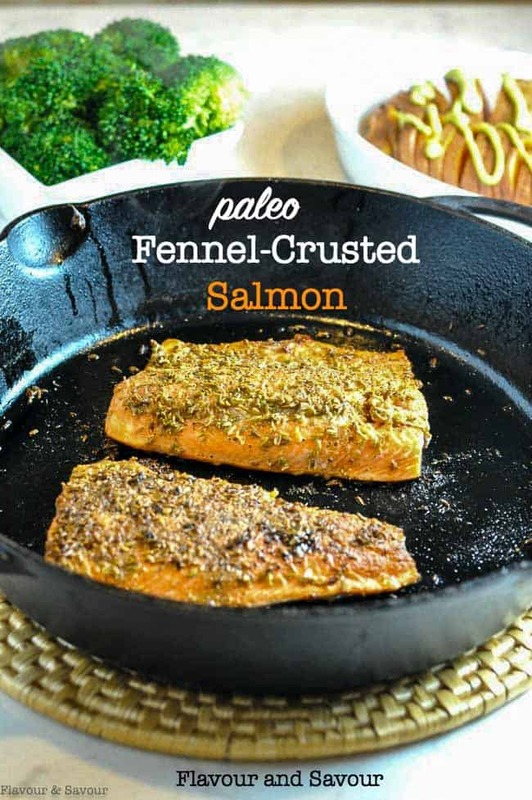 The crusty coating complements the flavour of the salmon without overpowering it. 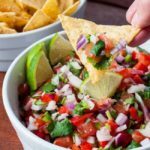 Not only is it delicious, it makes a quick and easy paleo, Whole30, and Keto-friendly dish that can be on the table in less than 30 minutes. 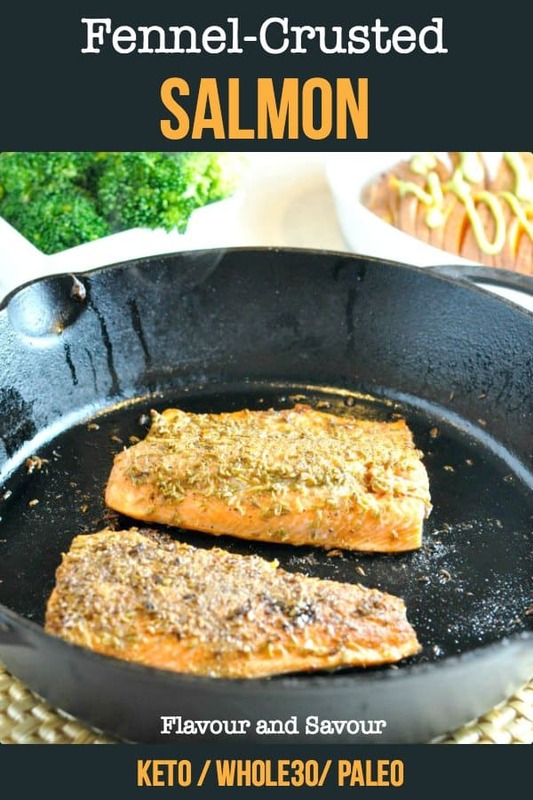 I have a good reason for focusing on salmon recipes lately. While searching through the deep freeze yesterday, I discovered wild-caught salmon, way at the bottom. I found sockeye and coho, both whole fish and fillets, so it seemed like a great day to make a healthy meal of salmon. Wild salmon is a powerhouse of nutrients and nutritionists recommend that we eat it once or twice a week. 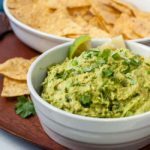 It contains two of the most important omega-3 fatty acids, nutrients that our bodies can’t produce themselves so we have to obtain them from our food. It’s packed with protein, but we eat it mainly because it simply tastes so good! 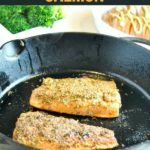 This Fennel-Crusted Salmon takes less than 30 minutes to make! 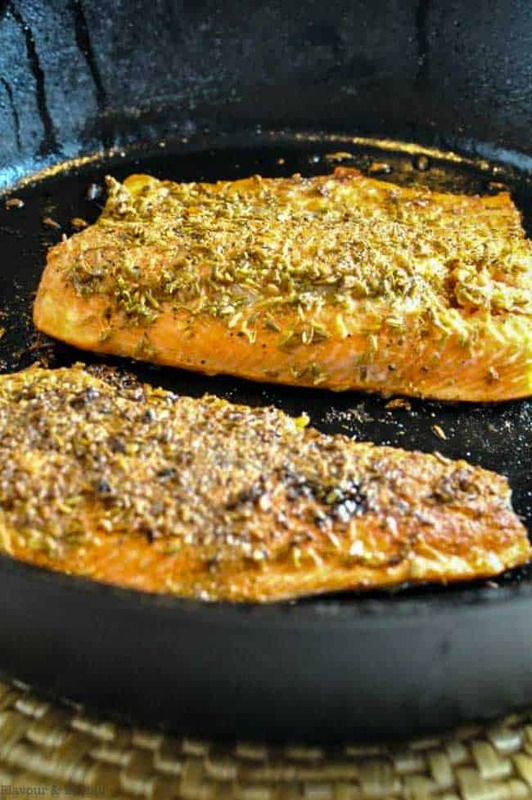 Brush salmon fillets with olive oil and coat with fennel, salt and pepper. Sear on the stove top in an oven-proof skillet. Finish baking in the oven until fish flakes easily with a fork. Serve with Baby Hasselback Sweet Potatoes, (not keto) lightly steamed broccoli and this Triple Berry Mixed Green Salad. I hope you enjoy this dinner as much as we do! This recipe for Fennel-Crusted Salmon makes a fast but fancy meal than can be ready in less than 30 minutes. Rinse salmon and pat dry. Remove pin bones if they have not already been removed. Crush the fennel seeds, peppercorns and sea salt together, using either a mortar and pestle or a mini grinder. Brush the fillets with olive oil and coat with the fennel mixture. In an ovenproof skillet, heat the oil over medium-high heat. Add the salmon, with the fennel mix side down (skin-side up) and heat for about 5 minutes. Flip the fillets over and finish cooking in the oven for another 4 - 5 minutes, depending on the thickness of the fillets, until the fish flakes easily with a fork. Remove from the oven and let stand for 5 minutes. Slip the skin off before serving. 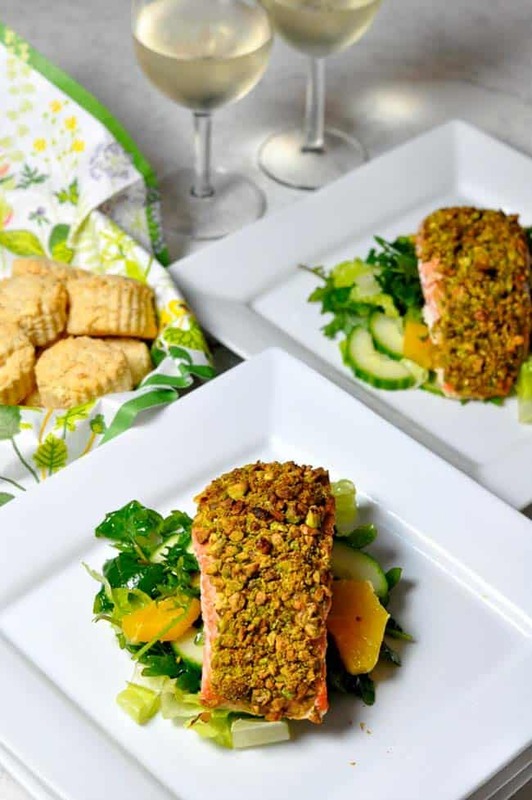 Try this Pistachio-Crusted Salmon, too! This salmon is so tasty. 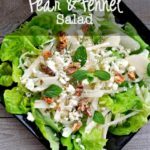 Crushed fennel with salt and pepper is so simple, but it added so much flavour. Will be adding this to our meal rotation. Thank you! Thanks for letting me know how it turned out for you. So glad you like it!